A surprise was in store for MG enthusiasts at the 1932 Motor Show with the last minute launch of a new series of 6 cylinder cars designated Magnette. The already popular Magna range of MG's or "Light Sixes" as they were often referred to, continued in production alongside the smaller engined overhead cam J types. The six cylinder cars did not generate quite the same following as the four cylinder higher-revving stablemates, nonetheless they fulfilled a market need aimed at those enthusiasts who wanted a bit more refinement and could afford to pay for it. The six cylinder cars were produced in relatively small numbers compared to the Midgets of the era, mainly due to the cost and performance penalties, but the decision was taken to follow the example set by some of the European manufacturers who had found a successful formula in small capacity, low geared power units that could easily move heavyweight chassis. The trend towards the six cylinder cars can be appreciated when you consider that most of the four cylinder cars that were available in the early 1930's had solidly mounted engines and "crash" gearboxes. The small six cylinder cars ran a lot more smoothly with minimal vibration and had plenty of torque which negated the endless gear changes normally necessary in the four cylinder cars. The price penalty manifested itself in the end cost of the six cylinder cars and also the horsepower tax rating which meant that a six cylinder engine of 1100 cc to 1300 cc paid as much tax as a 1500 cc four cylinder car. The performance penalty was in the form of very small bore diameters with long stroke to reduce the engine capacity (in keeping with the horsepower tax formula) and whilst the acceleration was far from exhilarating, high speed cruising was a pleasure. 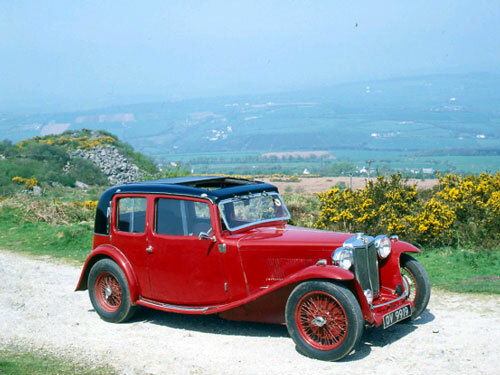 The origins of the MG Tight six' cars stemmed from the Wolseley Hornet, first produced in 1930 and Cecil Kimber realised that with the impending demise of the large six cylinder 18/80's that appealed to the wealthier MG fraternity, he had to find a mid-range replacement. The Wolseley Hornet, coming from the same family, was an ideal candidate to "borrow" ideas and parts from. The delightfully smooth 12 hp engine was to be the basis to power Kimber's new F type Magna launched in September 1931. Abingdon tried to pretend that this engine was a brand new design with the engineers cleverly tacking two extra cylinders on and camouflaging the cylinder block with sheet steel to disguise its Wolseley origins. The F type was very well received and priced at £250 for the open two seater, was good value compared to the 18/80 Mkll at £625. It sold steadily despite its disappointing performance but the hankering for better 6 cylinder performance soon brought Kimber to introduce a new range of cars with a view to extending Abingdon's participation in Class G (1100 cc) motor sport. Kimber could not justify the production of a model just for competition but the K series Magnettes allowed him to conceal an out and out racing model amongst the more sedate saloons and open topped touring cars in the range. Named Magnette, the range fell midway between the 847 cc Midgets and the 1271 cc Magnas and although the Magnettes cost over £100 more than their Magna counterparts, Abingdon was keen to point out in the sales literature that the engine was of completely new design and was sturdy enough to take a supercharger without modification, which emphasised the racing intentions. The brochure described the engine thus; "The overhead camshaft engine of this series is entirely new, consequently there is a very big margin of safety as produced in unsupercharged form". The new K Magnette chassis was available in two different wheelbase lengths, one of 9' 0" exactly and the other of 7' 10.1875". The longer chassis carried the open top 4 seater tourer or the unusual closed 4 door saloon which had no central door pillar and became known as the KN "pillarless" saloon. This shapely and well proportioned MG was favourably received by the motoring press and performed reasonably well for a heavy sports saloon. Priced at £445 it was not considered cheap, nonetheless the car was well appointed and very comfortable. On the shorter chassis there were options of a two seater sports and two versions of the K3 racing car, one supercharged and one unsupercharged. The K series cars had several different versions of the 1086 cc engine unit fitted and they were designated KA, KB, KD and K3. There were also three different types of gearbox fitted, add this to the five alternative body styles together with the small build quantities and you will realise that no two vehicles ever seemed to be identical. The new six cylinder Magnette engine was loosely based on the Wolseley Hornet design with the stroke reduced from 83 mm to 71 mm to give an engine capacity of 1087cc. Other refinements included large diameter 13" brakes (cable operated) and an improved steering system that incorporated a divided track rod to try and eliminate the common problem of "steering wheel kick back" normally encountered on conventional beam axle systems. The cylinder head was of cross-flow design and ignition was by magneto. A pre-selector gearbox was employed which at the time were much in vogue and whilst other manufacturers normally mounted the selector lever on the steering column, MG placed a very neat and stubby selector lever on the top of the gearbox itself ensuring rapid selection. The KA engine, as installed exclusively in the Saloon, had a special "slower" camshaft to allow the fitment of the ENV pre-selector gearbox as the engine tickover speed needed to be kept below 500 rpm to avoid the car creeping unless checked by the brakes. The KB engine had standard valve timing with the four speed gearbox being driven through a twin plate dry clutch and was installed in Kl two and four seaters. The KC engine, just to throw in some confusion, had coil ignition and was not fitted to any K type, instead was used to power a new F type replace-ment, designated the L type Magna that appeared in 1933. The K3 engine was used both in supercharged and unsupercharged form in the K3 racing cars. The KD engine was available in late 1933 and reverted back to the original bore and stroke which increased the capacity to 1271 cc. This power unit was then offered to the whole range of K types and was normally combined with the pre-selector gearbox. The problems of "creeping" associated with the standard valve timing were overcome with the by utilising a clutch between the gearbox and engine that disconnected the drive once neutral was selected. A 25% increase in power was gained by the new KD engine which transformed the cars performance considerably. Capacity: KA, KB: 1086cc. KD: 1271cc. K3: 1087cc. Power Output: KA: 39 bhp @ 5,500 rpm. KB: 41 bhp @ 5,500 rpm. KD: 48 bhp @ 5,500 rpm. K3: approx 120 bhp @ 6,500 rpm. Valve operation: Single overhead camshaft driven through vertical dynamo. Carburation: KA, KD: 3 x SU,OM. KD: 2 x SU HV2. K3: SU HV8. Gearbox: KA,KD: ENV preselector. KB; 4 speed Manual. Brakes: 13" drum, cable operated. Chassis: Steel channel with tubular cross members. Suspension: Half elliptic front & rear with sliding trunnions. Wheelbase: K1: 9' 0". K2: 7' 10.1875". Track: 4' 0". Steering: Marles worm and peg type. Numbers produced: K1 Tourer; 97. K1 Saloon; 74. K2; 20. Chassis only; 35 K3; 33.